SSC CHSL 2016 Tentative Vacancy – SSC LDC, DEO Vacancy Chart Download PDF: Looking for SSC CHSL 2016 Vacancy Chart for LDC, DEO, PA/ SA posts? 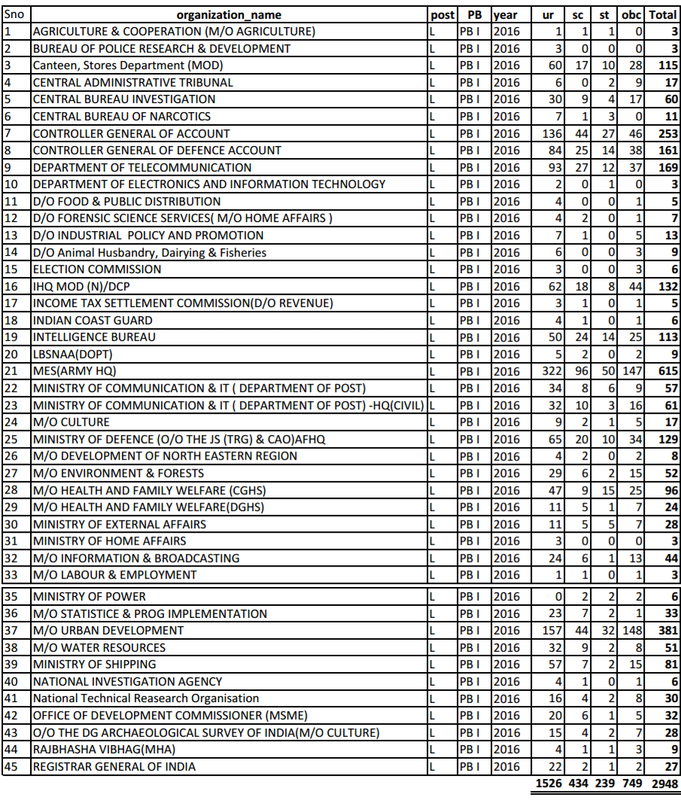 SSC Combined Higher Secondary Level (10+2) Vacancy Table released. Are you looking for tentative vacancy of SSC LDC DEO 2016? SSC CHSL 2016 has total 6778 Vacancies for LDC, DEO and PA-SA posts. The Staff Selection Commission (SSC) has finally released a detail of tentative vacancy for Lower Divisional Clerk (LDC), Data Entry Operator (DEO) and Posting/ Sorting Assistant (PA/ SA) post under Combined Higher Secondary Level (CHSL) Examination - 2016 with pay scale details. Candidates can check how many vacancies are there in SSC CHSL 2016 examination? Here in the post below we have come up with complete list of SSC CHSL Vacancy. Candidates appeared in SSC CHSL 2016 exam must go through its vacancy chart. As we all know SSC Doesn't declare tentative vacancies in SSC Exam Calendar. 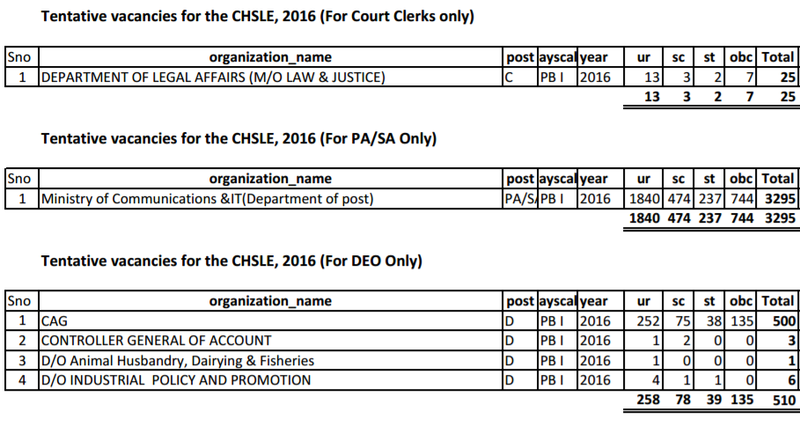 In the notification released by SSC, they have posted List of available vacancy for various LDC, DEO and PA-SA posts through SSC CHSL 2016. Some of the big vacancies in SSC CHSL 2016 are as follows; 2948 posts are available for Lower Divisional Clerk (LDC), 3295 posts are available for Posting/ Sorting Assistant (PA-SA), 510 posts for Data Entry Operator and 25 posts for Court Clerk posts. Check full lists along with department are given below. How many vacancy are there in SSC CHSL (10+2) level this year? How many LDC vacancy available for Clerk Posts? How many DEO vacancy available? How many Postal Assistant (PA/ SA) vacancy available in Postal Department through SSC CHSL this year? These are the questions candidates have in their mind who recently appeared at SSC CHSL 2016 examination and now waiting for SSC LDC DEO results. The SSC CHSL 2016 vacancy chart contains Categories wise, Post Wise, Community and Department wise SSC CHSL 2016 Vacancy details. Download PDF of SSC CHSL 2016 Vacancy Chart [Click here]. SSC CGL 2016 Final Vacancy.